CHIP has enjoyed bipartisan support since its inception in 1997, but this year, legislators let the deadline for reauthorizing it pass as they bickered over other health care issues, primarily the latest Republican-led push to repeal and replace the Affordable Care Act. While Americans are split over how to handle Obamacare, three-quarters of the public want CHIP renewed, according to the September Kaiser Health Tracking Poll. Support for allowing these immigrants to remain in the U.S. spans across party lines: 84 percent of Democrats, 74 percent of independents and 69 percent of Republicans think they should stay. The Senate has approved President Trump's selection of Jerome Powell to be the next chairman of the Federal Reserve beginning next month. Senators voted 85-12 to confirm Powell to lead the nation's central bank, a post that's considered the most powerful economic position in government, per the AP. Powell will succeed Janet Yellen, the first woman to lead the Fed, when her term ends Feb. 3. Trump decided against offering Yellen a second four-year term as chair despite widespread praise for her performance since succeeding Ben Bernanke. Let me rephrase that for you. Obama appointed a very successful Fed Chair, so Trump not only had to undo that success but in replacing Chair Yellen, he appointed former-investment-banker-not-an-economist Jerome Powell. But it's not all bad news. The conservative Powell has been a voice of reason in the past, pushing Republicans to promptly raise debt ceilings and has cautioned against defaults. And given that he has served as a member of the FOMC (the Fed Open Market Committee) for just over five years already, he has plenty of experience working under Yellen and learning about what makes good economic policy. And, in truth, it's really not that difficult to be a Fed Chair when times are good. Your only responsibility is to make sure inflation does not exceed 2%. As an economist, I was fine with the choice when it was made. After all, President Obama originally nominated Powell as part of a bipartisan appointment to maintain balance at the FOMC (the arch-conservative economist Fred Mishkin had retired) which absolutely needs to remain a nonpartisan entity. And Obama would not have nominated a blind partisan from the Right to fill that position. 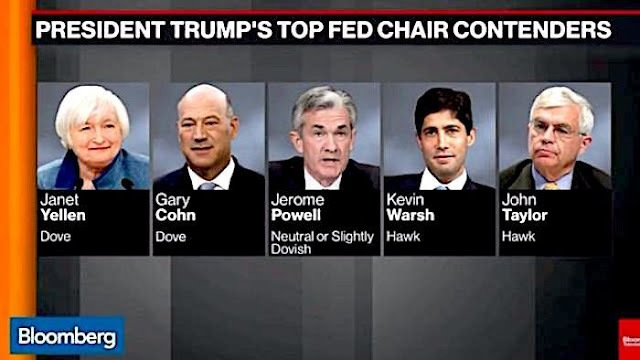 If it wasn't going to be Yellen, our choices were the clueless supply-sider Gary Cohn (not a dove) or Warsh or Taylor who literally want to tear everything down. We quite literally dodged a bullet. Of course, time will tell if he will be more like the Republican-appointed Ben Bernanke who staved off disaster or the Republican-appointed Alan Greenspan who undermined the recovery tools in order to prop up the woeful Bush Era recovery.